So many packaged or bulk granolas have glutenous ingredients, are packed full of nuts (I'm allergic to almost all of them), are waaaay too sweet for my tastes, or have more dried fruit than I like. And thus, I prefer making my own granola. Not only is it cheaper, but I can make it fit my tastes and dietary restrictions perfectly! Here's a recipe I'm making a lot lately. It boasts a variety of seeds (pumpkin, sunflower, sesame, and flax) as well as coconut, honey, spices, vanilla, and raisins. As for the fat, I love using coconut oil in granola; it lends a wonderfully sweet flavor and fragrance. With a splash of coconut milk or a dollop of Greek yogurt, it makes a great energy-packed breakfast or snack. 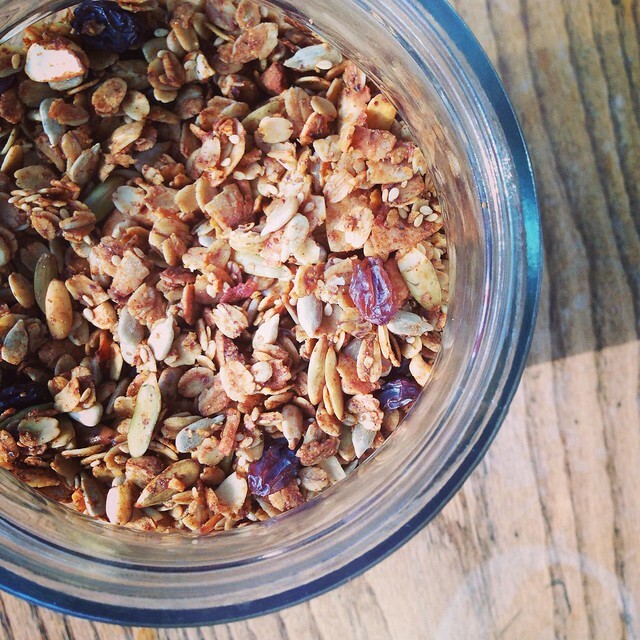 This granola is very lightly sweetened with honey. I love the subtle sweetness in combination with the roasty toasty oats and seeds. If you prefer a sweeter granola, feel free to up the quantity of sweetener to 1/2 or 2/3 cup, to fit your tastes. It will still work a-okay, but based on my experiences, it will need to bake just a little longer due to the extra moisture. Pre-heat oven to 325º F and line two large baking sheets with parchment paper. In a large bowl, mix together oats, coconut chips, seeds, salt, and spices. Set aside. In a small saucepan on the stovetop, melt together honey and coconut oil over low heat, stirring often, until liquid. Stir in vanilla extract, if using. Pour liquid mixture over dry ingredients and stir until evenly coated. Divide granola between baking sheets and spread evently in a thin layer over surface. Place in pre-heated oven and bake for 15 minutes. Remove pans from oven, stir granola, and place pans back in oven on opposite shelves. Bake another 15 minutes, until golden brown. Remove pans from oven and let cool completely. Granola will crisp as it cools. 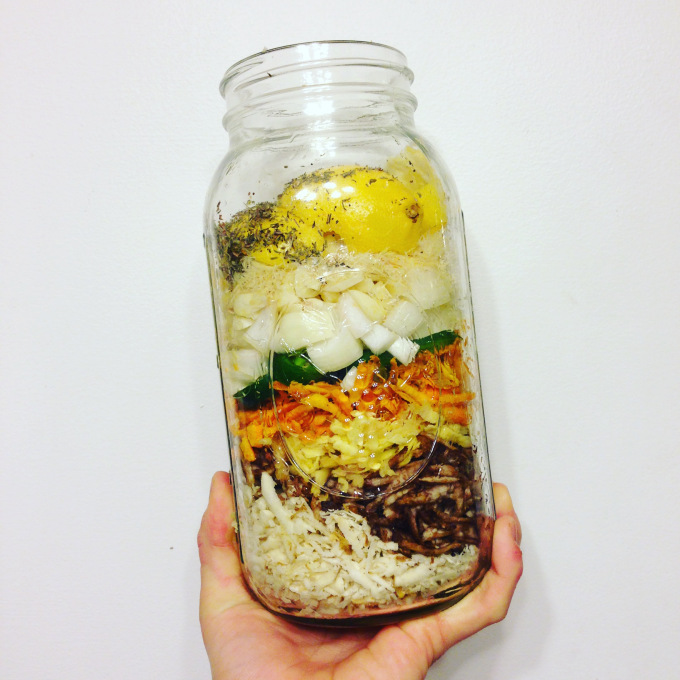 Once cool, store in sealed jars or containers. Will keep for 2 weeks. 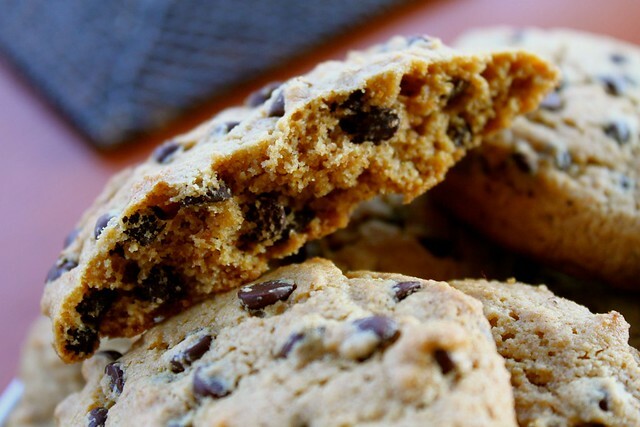 Substitute raisins with any other dried fruit. Substitute honey with other liquid sweetener (maple syrup, agave nectar, brown rice syrup). Keep in mind each one has a different intensity of sweetness, so it may be less - or more - sweet depending on your substitution. S.O.S. Kitchen Challenge Kick-Off: Caramelized Onion, Beet, and Rhubarb Compote. Can you "beet" that?! So it's not *really* spring here yet. Technically it is, but the ongoing weather proves otherwise. It was snowing out this morning! For obvious reasons, "spring" food isn't really happening yet. I yearn for pea shoots, fresh lettuces, tiny radishes, and sweet crunchy kohlrabi. But given the chilly temperatures, I'm still eating root veggies, cooked greens, etc etc etc. Geez. Since it feels like we are moving backward through the seasons instead of forward, diving headlong back into fall, I decided to make some pumpkin muffins. They are a little autumnal for this time of year, but based on the chilly temperatures, they fit right in. Aaaaand they are gluten-free, dairy-free, and cane sugar-free. 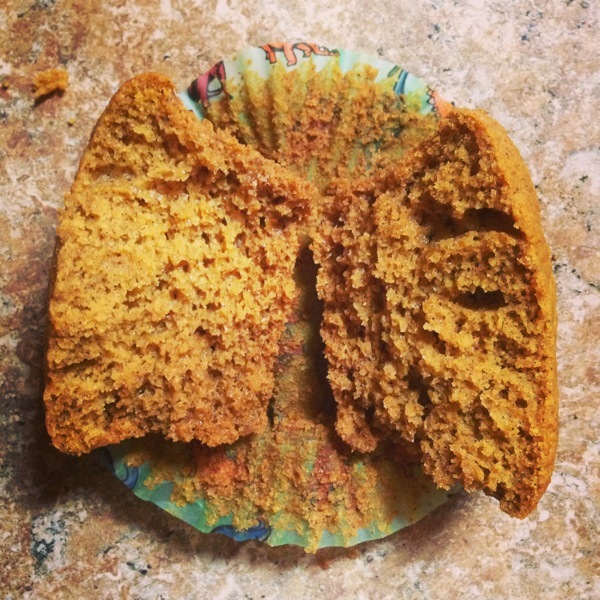 I like this recipe because it makes a muffin that isn't very sweet. You can really taste the pumpkin! I mean really, if you are looking for sugarbomb baked goods, you are reading the wrong blog. 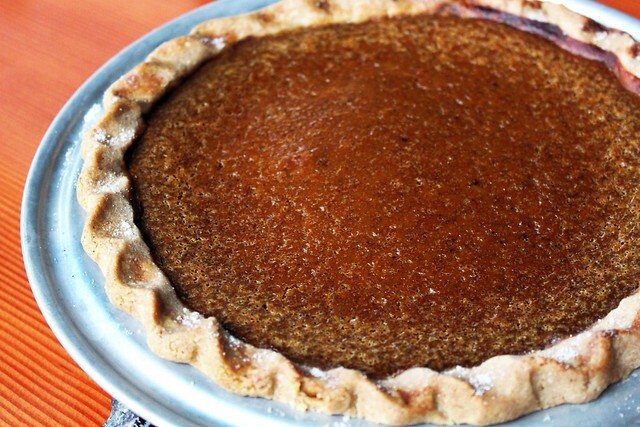 They are moist and just a little sweet, with a good balance of pumpkin flavor and spice. Nice. I like this recipe because it is free of xanthan gum or other binders, and is low in sugar. This yields 10 to 12 muffins, depending on how exact you are with filling the muffin tins and how large your muffin tins are. I have not tried this using a "flax" egg or another egg-substitute. If you do, please let me know how it works for you! Preheat oven to 350 degrees F. Grease a muffin tin very well or line with cute muffin papers (I like dinosaur muffin papers). In a medium bowl, whisk together the flours, starch, baking soda, baking powder, salt, and pumpkin pie spice until mixture is light and well-mixed. Set aside. 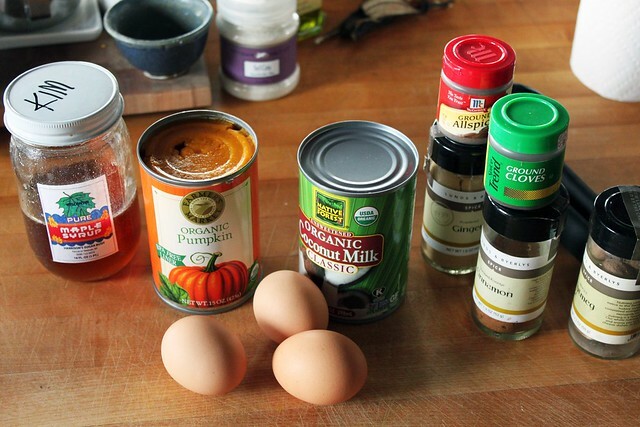 In a large bowl with stand mixer or hand mixer, combine pumpkin, eggs, oil, water, vanilla, and Agave nectar. Mix until ingredients are smooth and well-combined. Then add dry ingredients gradually, scraping sides as you go, until mixture is just combined. Spoon batter into the prepared muffin pan, filling about 3/4 of the way ( I like using a cookie scoop for this - easy peasy!) and place in the pre-heated oven. Bake in preheated oven for 25-30 minutes or until a toothpick inserted in the center comes out clean. Remove from oven and cool 10 minutes in pan, then remove from pan and allow to finish cooling on rack. Store in a well-sealed container or wrapped tightly in foil or in a storage bag. These muffins freeze well and can be thawed at room temperature or on a defrost setting in the microwave. These words struck fear in my heart for years. I tried, and tried, and tried. And each time, I was like "F***!" when I had another crust that just wouldn't roll correctly, was dry and sandy, was tough and chewy, or was just plain weird. Then back in May, something happened. I made a crust I was happy with. Then I made another. And another. It was reliable. Easy. Delicious. FLAKY. And now I will share it with you, filled with a delicious maple syrup-sweetened pumpkin pie filling. 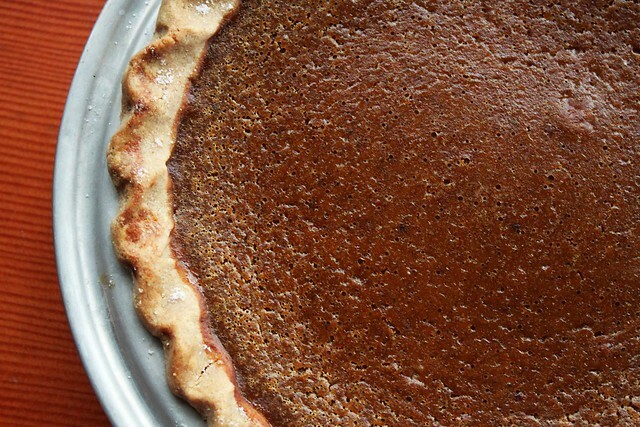 I've made this pie time after time this fall, and it is always a winner with everyone who tries it. I like it best as leftovers, pulled from the fridge and eaten for breakfast. Continue for the recipe! I bake a lot. When I'm stressed, I bake. When I'm sad, I bake. When it's chilly outside, I bake. When I'm bored, I bake. It's a little excessive sometimes, actually, but much to the benefit of my the people in my life. The other day, sure enough, the urge struck and I needed to satisfy it. I hadn't tried my hand at a nut butter cookie for a while so gave it a go. After some research and brainstorming, I whipped together this recipe and it was a total hit! Not only is the dough totally bomb, the finished cookies are both beautiful and delicious. 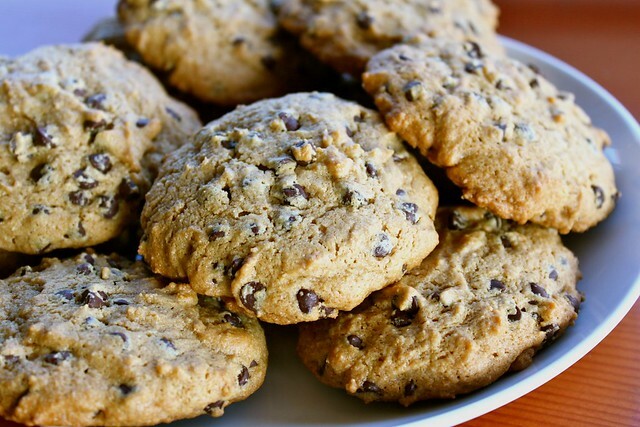 Crisp on the outside, soft and a little chewy on the inside, and with a nice subtle cashew butter flavor. And best yet, they stayed a little chewy and moist for three days. None of that dry, crumbly cookie business here. Instead of sweetening it with a ton of cane sugar, I used a combination of coconut sugar and maple syrup. This combination creates a great flavor that isn't too sweet and carries far less sugar and calories than a traditional recipe. I took some of the cookies to school the other day and shared them with my fellow acupuncture students. Everyone loved them! In fact, a couple of people declared that they wouldn't have ever guessed they were gluten-free. I hope you like them as much as I did. This recipe calls for a blend of four flours, which may seem like a lot, but it makes a great mix. Sorghum and brown rice flours are both easy to find and affordable. Arrowroot flour and arrowroot starch are the same thing, but just go by two different names. Same with tapioca flour and tapioca starch. Arrowroot and tapioca are interchangeable in this recipe, so feel free to use whichever you have in your pantry. There is not a substitute for sweet rice flour, so try to get your hands on some. Look in the gluten-free flour section, or for the best deal, the Asian food section of your local grocery store or better yet, an Asian grocery store. Sweet rice flour is also known as glutinous rice flour, but don't be scared - it doesn't contain gluten! Sweet rice is often called glutinous rice because it is really sticky stuff. That's why the flour is so great - it helps hold things together and keep things moist and chewy. In a large bowl, cream together butter and cashew butter until smooth with a handmixer or in a standing mixer. Add coconut sugar and maple syrup and continue to mix until smooth. The coconut sugar will not dissolve the same way and get totally creamy like granulated white sugar, so don't be surprised if there are small gritty pieces of coconut sugar. That's okay! Then add eggs one at a time and vanilla. Mix until everything well-incorporated. Add dry ingredients to wet ingredients gradually, mixing on low and scraping sides as necessary, then turning up to a higher speed to fully incorporate all the ingredients. Then add chocolate chips and mix one final time. I think the dough bakes up better after it has had the chance to rest for a few hours, or even better, a whole day or two or three, in the fridge. Something magical happens to cookie dough as it continues to sit, the flour absorbs the moisture and I think it results in a chewier cookie. So at this point, I suggest covering it with plastic wrap and putting the bowl in the fridge and letting it hang out for a bit. But if you want to bake it right away, that's fine too! When ready to bake, pre-heat oven to 350º F. Line a baking sheet with parchment and scoop dough by the heaping tablespoonful onto the baking sheet. Bake for approximately 12 minutes, or until edges are just browned and the middles are still slightly soft. Let cool on a baking sheet for 5 minutes and then transfer to a cooling rack. Bake in batches until all the dough is gone! Store in a tightly sealed container or plastic bag for up to 3 days.